Party ghosts, blood bank robberies and demonic teenagers are just an average night out for the cops behind ‘Wellington Paranormal’. There’s more to this New Zealand comedy series than its monster-of-the-week gag. Fangs, hauntings and graveyard goths aside, Wellington Paranormal also looks at the trials and tribulations of trying to get the job done without causing a fuss. The show follows the run-of-the-mill work routines of two cops – Minogue and O’Leary – in their newly assigned roles of investigating locally reported supernatural activity and trying (typically, avoiding) to save the day. Ahead of the Boxing Day marathon of season one, here’s why you should keep watching until the final ghoul exits stage left. Serious sci-fi television – science fiction fuelled by prestige – is all about shiny, better-in-slo-mo concepts: futures we can only imagine, life and beings on faraway planets, technology far more advanced than our own. Meanwhile, Wellington Paranormal embraces a lo-fi can’t-quite-be-bothered ethos that swaps CGI for shaky camera footage, obvious heroes for endearing schmucks who don’t know any better. For those of us who may be going through blockbuster fatigue, this is a welcome antidote showing us how the spookiest – and oddest – of circumstances can crop up in the most mundane settings. A corn field out in the country could bring out extra-terrestrials after dark. A work colleague going through the motions of their job could actually be an undead zombie. The possibilities are endless. “Think Mulder & Scully but in a country where nothing happens,” said executive producer Taika Waititi, when pitching the show on Twitter. But while Dana Scully was responsible for ‘the Scully effect’ (inspiring women to pursue careers in STEM) and together with her partner Fox Mulder created the iconic pairing of the skeptic and the believer, Minogue and O’Leary end up doing all the wrong things. Getting stuck in fences, snapping selfies with the monsters they’re meant to be putting behind bars, and even letting those otherworldly creatures get behind the wheel and drive off in their car. Still, their friendship weathers all the odds and the constant unease of being an authority figure. One of the purest moments in the series is when Minogue, in a moment of vulnerability, admits to his partner, “You know I look up to you, O’Leary”. While it’s obvious they don’t have the faintest clue how to get the job done, it’s still a delight to watch them try, week after week. Officers O'Leary and Minogue and Sergeant Maaka attempting to look intimidating. Life can get pretty hectic when you’ve got vomiting demons, she-wolves and bloodthirsty vampires to deal with. Some might even suggest it’s better just to turn the other way while looking out for your community. Wellington Paranormal revels in the ‘this is fine’ brand of humour and encourages you to join in. Historically, as-seen-on-weeknight-television police officers might be known for showing off zen-like levels of patience when thrust in the face of aggression and violence, but Minogue and O’Leary take it one step further with an unaffected monotone that translates to their undeniably New Zealand sensibility. Maaka Pohatu stars as kind team leader, Sergeant Maaka. Maaka Pohatu, a founding member of The Modern Māori Quartet while still studying at drama school, plays the show’s temporary team leader, Sergeant Maaka. Encouraged to channel the diplomacy of New Zealand’s acting prime minister, Winston Peters on set, Pohatu’s casting was a deliberate choice on the part of Taika Waititi, who is often vocal about the importance of representing the stories of indigenous peoples on screen. Not only is Sergeant Maaka a supportive boss who actively mentors his team, but he’s full of comedic gold and acts as a brilliant balm of fearlessness to the hapless naivete of the still-very-green Paranormal Unit. Treat yourself to a Wellington Paranormal Boxing Day marathon, with all six episodes of season one airing from 8:30pm on SBS VICELAND, Wednesday 26 December. Binge on the good-natured investigators who bring the laughs by taking the hits in a Boxing Day marathon. From Dawn of The Dead to Ghostbusters to Chucky, mixing the supernatural with laughs has been a longtime staple of our favourite movies – NZ mockumentary series Wellington Paranormal is ready to join these classics. 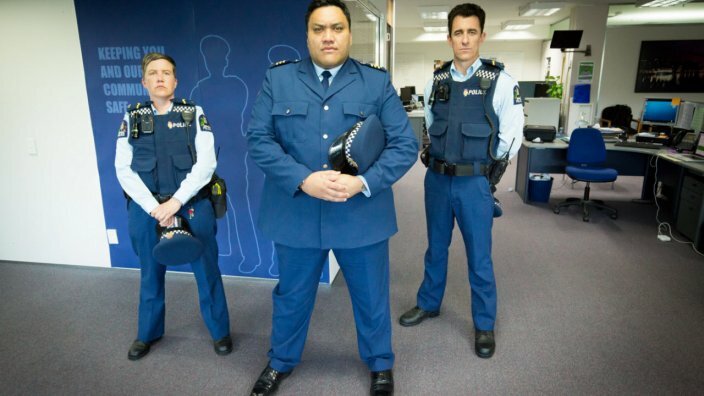 The cops from What We Do In The Shadows are now investigating a whole range of new supernatural petty crimes in Wellington.